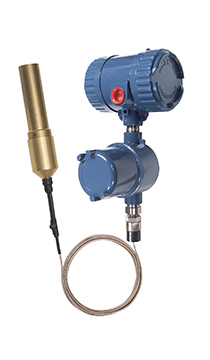 The SIL IntelliPointcapacitance probe level switch is specifically designed for Floating Roof Top Tanks (internal and external roofs) with a flexible brass level sensing probe. The level probe sensing element is field adjustable for lengths up to 15' (4.6 m). Electronincs are designed to meet API 2350 Overfill Protection. This level measurement system is specifically designed for spill prevention in floating roof tanks (internal and external roofs) using the IntelliPoint level switch with a flexible level sensing element for ease of installation (model 700-0005-595). This level measurement system meets API 2350 regulations. It is ideal for use in safety related systems with requirements for functional safety for SIL2 in accordance to IEC61508-2, ed2, 2010 (Exida). The Floating Roof Tanks system comes with field adjustable lengths from 1' to 15' (0.3 to 4.6 m). • Wetted Parts: 316SS 3/4" NPT Mounting, 3/16" FEP insulated flexible and adjustable cable, non-sparking brass sensor. • Automatic and local or remote manual test functions ensure proper system operation. In this video you will find the cleaning procedure for the Ametek Drexelbrook Intellipoint 594 Floating Roof Top Sensing Probe.